The year is 1906, and on the shores of Lake Michigan twelve-year-old Violet Blake unearths an ancient talisman—a copper hand. Violet's touch warms the copper hand and it begins to reveal glimpses of another time. 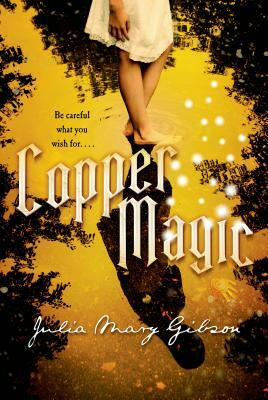 Violet is certain that the copper hand is magic—and if anyone is in need of its powers, it's Violet. Her mother and adored baby brother are gone, perhaps never to return. Her heartbroken father can't seem to sustain the failing farm on the outskirts of Pigeon Harbor, on the shores of Lake Michigan. JULIA MARY GIBSON was born the child of radical activist poets in the time of the Freedom Rides and the Vietnam War. She grew up to be a communard, welfare mother, waitress, secretary, visual effects producer, and mentor to unwed teens. She lives in sight of the Hollywood sign in California. Copper Magic is her first novel.